© 2002, © 2019 by Paul Freeman. Revised 3/11/19. 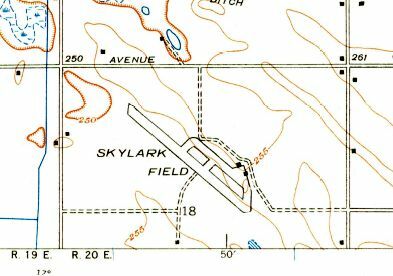 Skylark Field, as depicted on the 1946 USGS topo map (courtesy of Dallam Oliver-Lee). nor listed among active airfields in the 1945 AAF Airfields Directory (courtesy of Chris Kennedy). The earliest depiction which has been located of Skylark Field was on the 1946 USGS topo map (courtesy of Dallam Oliver-Lee). It depicted Skylark Field as having a northwest/southeast runway with a parallel taxiway, and a ramp on the east side with 2 small buildings. 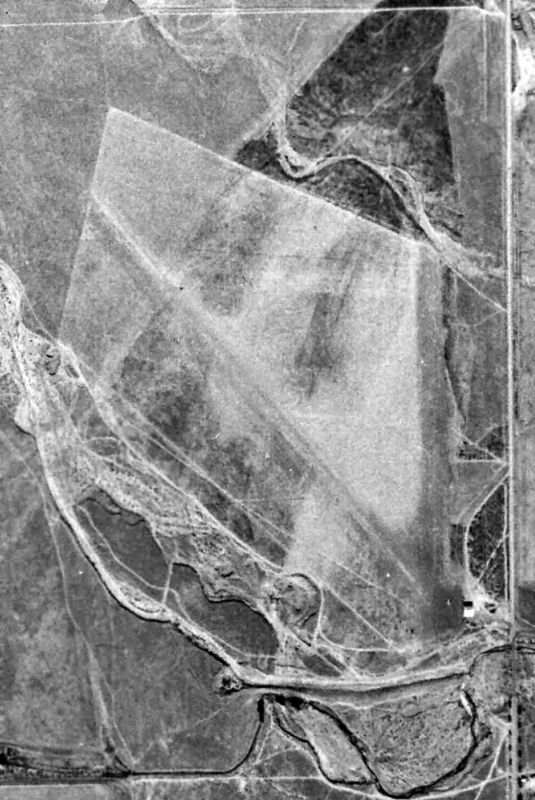 The only photo which has been located of Skylark Field was a 4/23/46 USGS aerial view (courtesy of Dallam Oliver-Lee). and a ramp on the east side with 3 single-engine aircraft & a hangar with “Skylark” painted on the roof. depicted Skylark as a commercial/municipal airport. as it was no longer depicted on the March 1952 Mt. Whitney Sectional Chart. 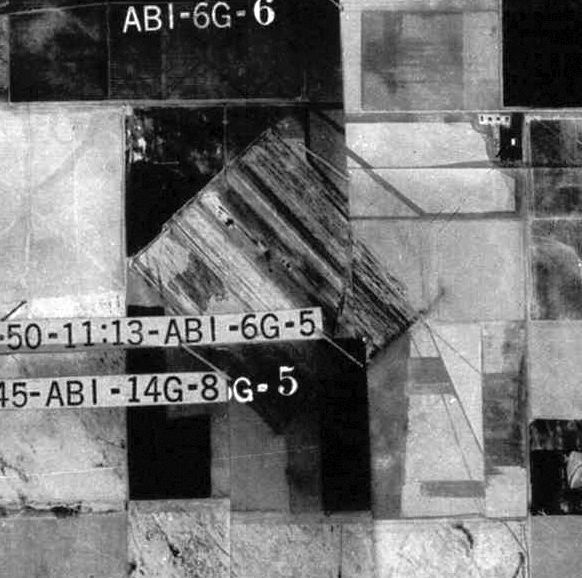 A 1956 USGS aerial view (courtesy of Dallam Oliver-Lee) showed the site of Skylark Field had been returned to farming. The runway was gone, but the hangar remained as the only trace of Skylark Field. even though it had evidently ceased to exist several years before that point. or on the October 1962 Mt. Whitney Sectional Chart (courtesy of Paul Columbus). the brown building in the center of the long rectangular buildings in the center of the picture. The site of Skylark Field is located southwest of the intersection of West Adams Avenue & South West Avenue. 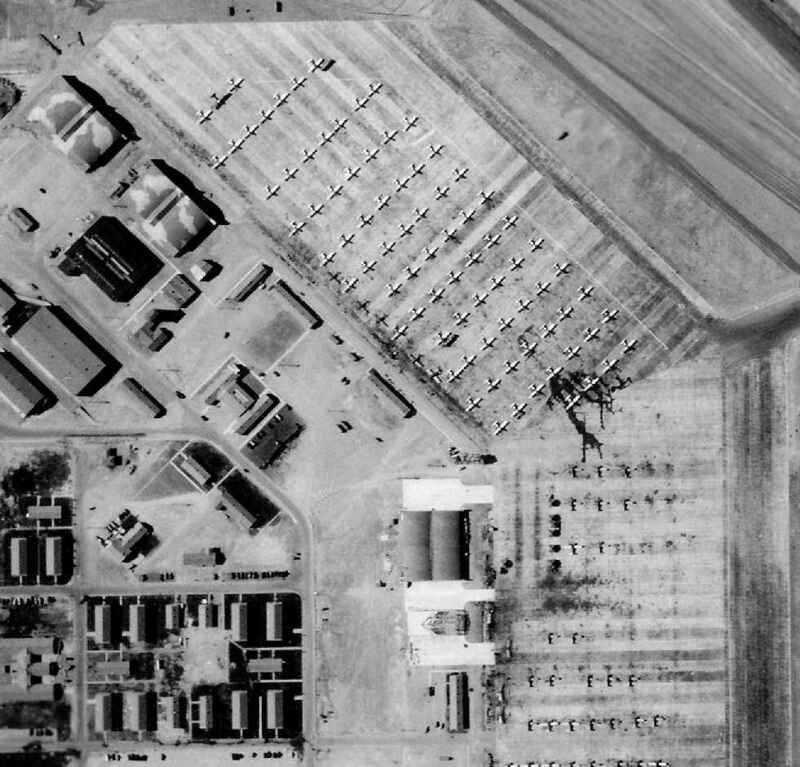 A 6/21/43 National Archives aerial view (courtesy of Brian Renhwinkel) of Lemoore AAF. 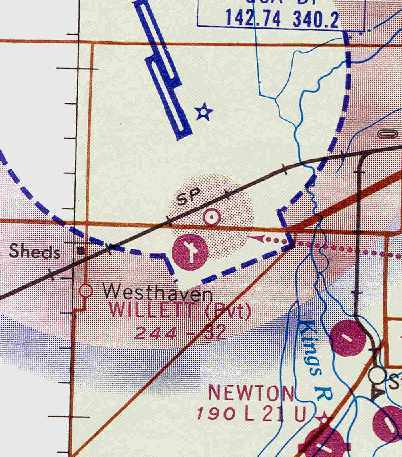 which is a separate airfield on the opposite (north) side of Route 198.
as no airfield was depicted at this location on the 1932 San Francisco - LA Air Navigation Map (courtesy of Herbert Haar). (according to a 1989 Army Corps of Engineers report). and 14 acres were acquired by transfer from the National Housing Agency. The site was used by the Department of the Army for a basic flying school & civilian war housing. water reservoir & water well, taxiways, runway, landing field, and 2 hangars. including an amphitheater & swimming pool. according to the Lemoore Army Flying School Class 43B yearbook (courtesy of Dallam Oliver-Lee). 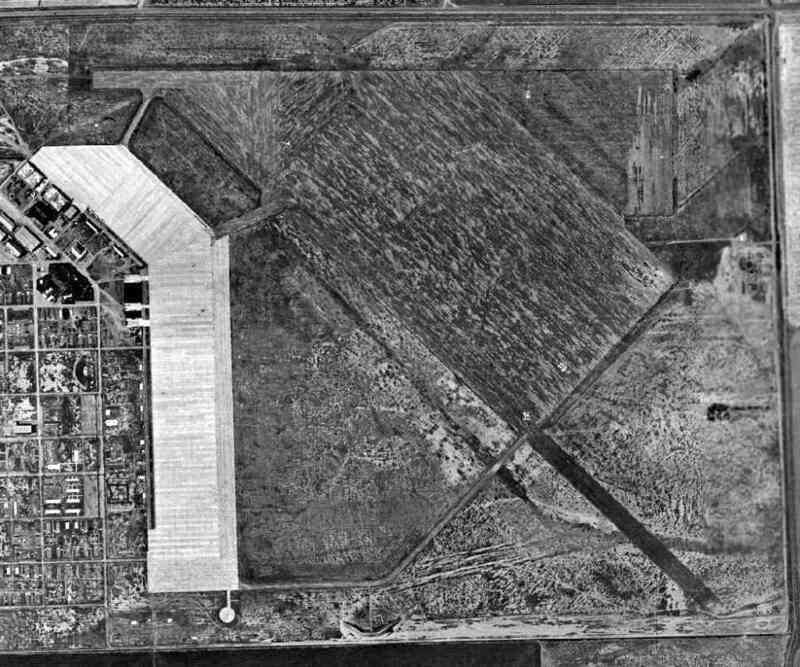 The earliest depiction which has been located of Lemoore AAF was a 6/21/43 National Archives aerial view (courtesy of Brian Renhwinkel). with a long concrete ramp on the west side, on which were parked no less than approximately 230 single-engine aircraft. which certainly did little to make this installation not stand out among the surrounding farmland. Over a hundred buildings were located west of the ramp. with asphalt runways oriented north/south, east/west, and a wide northwest/southeast strip divided into no less than 6 runways. 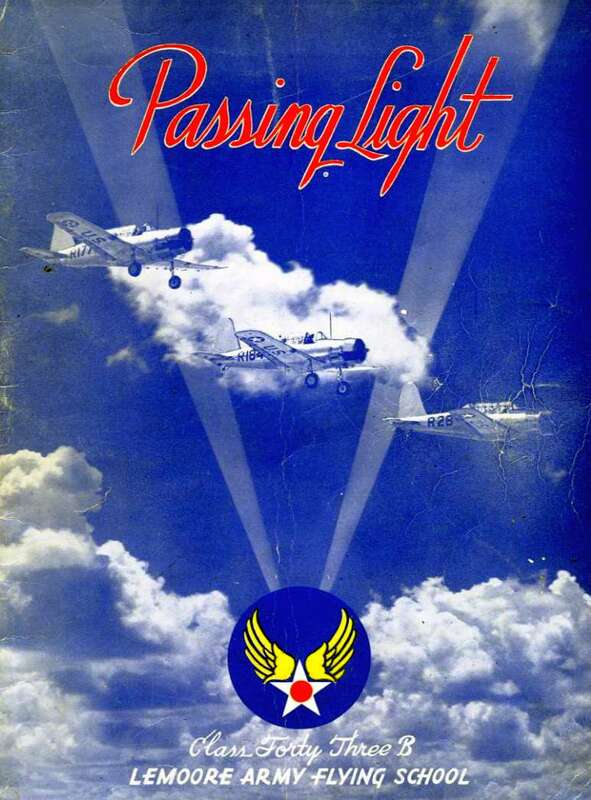 The cover of the Lemoore Army Flying School Class 43B yearbook, “Passing Light” (courtesy of Dallam Oliver-Lee). The book listed the commanding officer as Col. Donald Phillips. showing the huge number of aircraft, and the camouflage pattern on 2 of the hangars at the northwest. 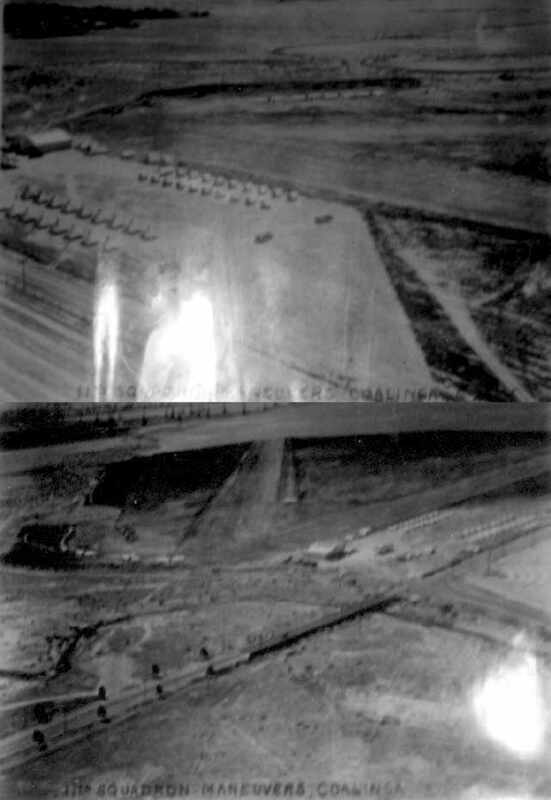 A 7/30/43 aerial view looking east at Lemoore AAF from the 1945 AAF Airfields Directory (courtesy of Chris Kennedy). with the longest being the 4,600' northwest/southeast strip with a 1,875' extension on the southeast end. The field was said to have a total of 5 hangars, the largest being 180' x 99'. was on the 1943 Mt Whitney Sectional Chart (according to Chris Kennedy). 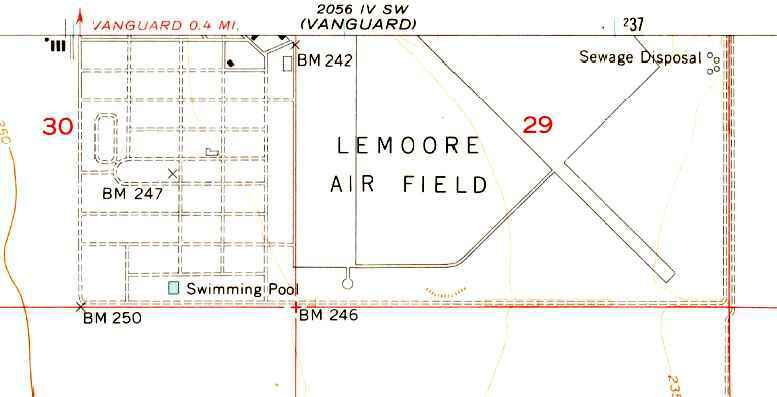 The chart slightly misspelled the name of the field, as "Le Moore Army Air Field". 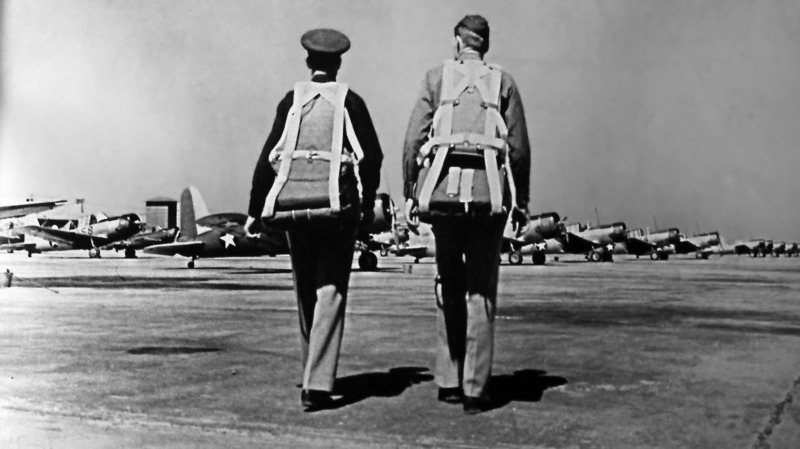 An undated photo of pilots walking out to rows of Vultee BT-13 trainers from the Lemoore 1943 Class Book (courtesy of Greg Mosholder). 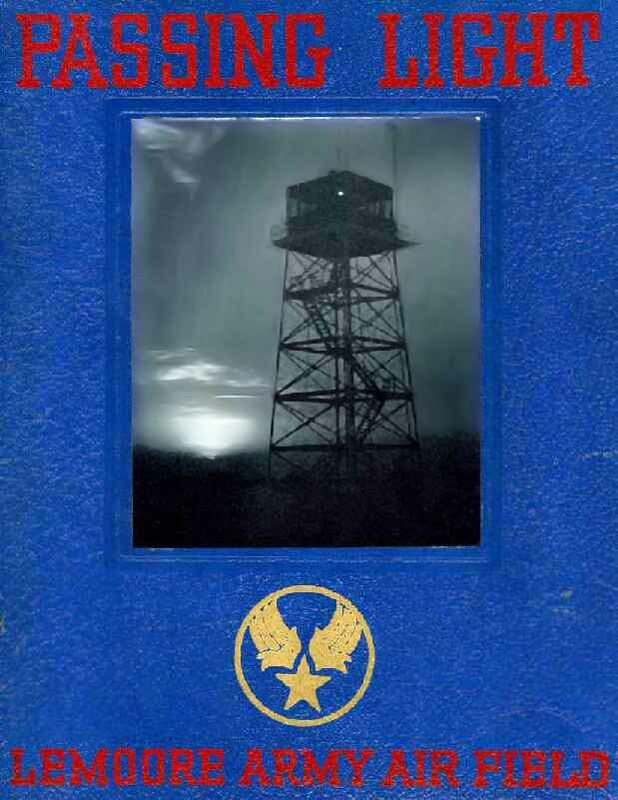 The cover of the Lemoore AAF Class 44D yearbook, with an undated photo of the field's control tower (courtesy of Walter Barber). Walter Barber recalled, “I was one of the cadets that trained at Lemoore in November & December 1943. We were the class of 44D, meaning that we would get our wings April 1944. I recall using the subsidiary fields such as Indian in practicing instruments takeoffs & various forms of emergency procedures. and some of us were moved up to twin-engine Cessna AT-17 Bobcat (Bamboo Bomber) which we flew out of Coalinga. (from the Lemoore AAF Class 44D yearbook, courtesy of Walter Barber). A WW2-era USAAF photo of a rare AT-20 trainer (a Canadian-built Avro Anson) marked with a Lemoore AAF “R” fuselage code. as having a 6,500' hard-surface runway, although the remarks included, "Entire field available only when dry." 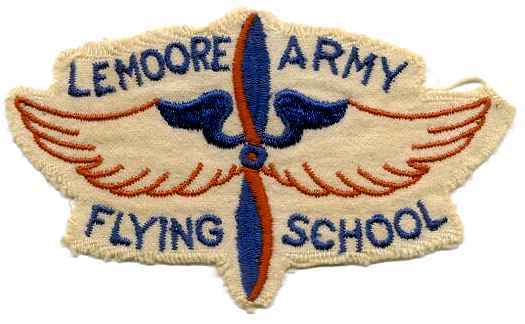 A 1944 patch for the Lemoore Army Flying School. According to Tim McCoy, “Lemoore was used later in the war as a training base for night fighters, probably 1944-45. There were P-70s, the night fighter version of the Douglas A-20, and P-61 Black Widows based there. My father was an instructor in night fighters & I have photos of some of the planes plus a couple of log books, and the books used for training. 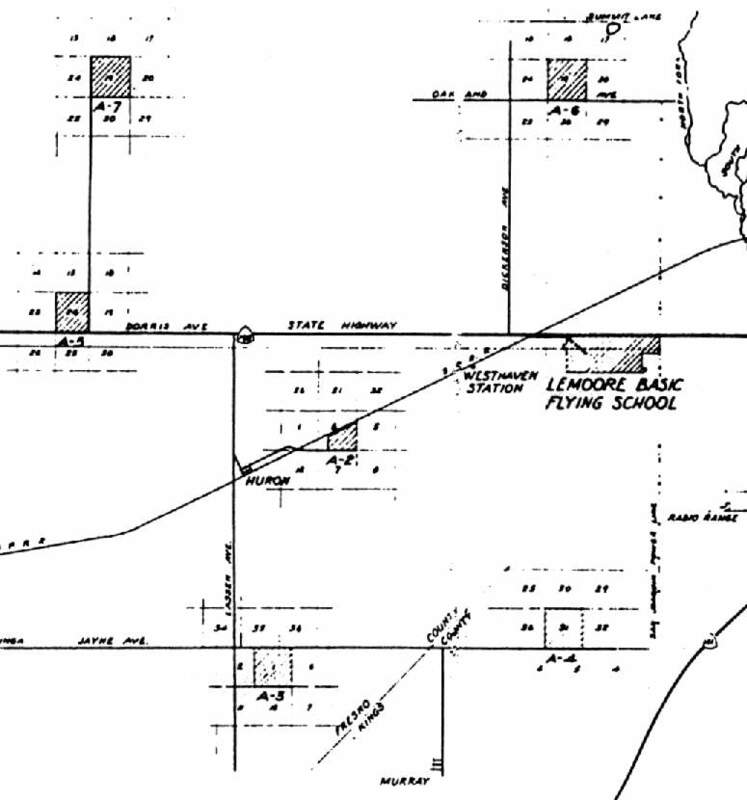 depicted “Lemoore Basic” along with its many auxiliary airfields. Dennis Vasquez recalled, “Richard Seay was an air cadet at Lemoore class 44-A. A-6 Summit Lake (7 miles north), and A-7 Helm (15 miles northwest). The satellite fields each consisted of a 3,000' square landing mat, with either a "road mix" or oiled surface. 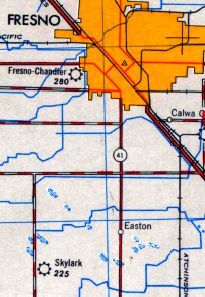 Additionally, the "Coalinga Emergency Landing Field" (22 miles west-southwest) was also designated for use by Lemoore AAF. which measured 3,470' along its longest side. A 3,700' long north/south apron sat to the southwest of the landing mat, and west of the apron was the building area. A WW2-era diagram of Lemoore AAF & its 6 satellite airfields (courtesy of John Voss). 6,475' northwest/southeast, 4,800' east/west, and 3,000' north/south. It said, "Runways marked on all-way landing area", so the only concrete was apparently the ramp areas. 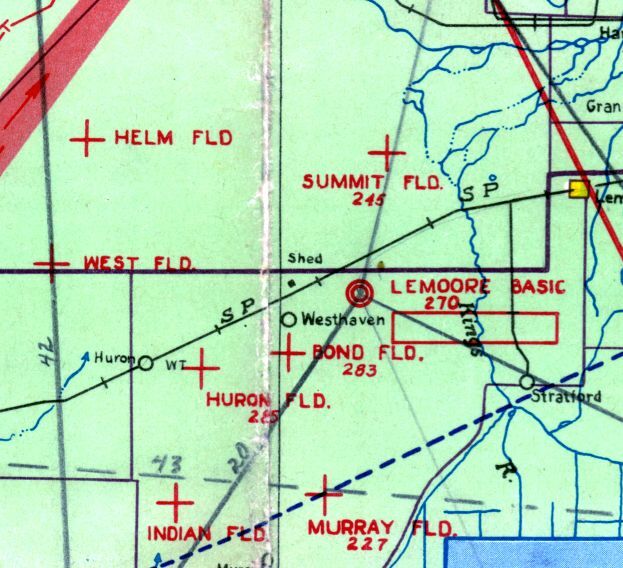 “Lemoore AAF” & its satellite airfields, as depicted on the March 1946 Mt. Whitney Sectional Chart (courtesy of Chris Kennedy). according to a 1989 Army Corps of Engineers report. 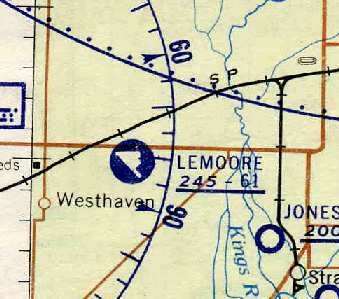 depicted “Lemoore” as an auxiliary airfield, with no indication of military use. The War Assets Administration transferred ownership of 750 acres of the site to the City of Lemoore on 11/16/48 (according to a 1989 Army Corps of Engineers report). which was significantly longer than the WW2-era diagram above had indicated. Ron Villi recalled, “Lemoore Army Air Base... George Willett conducted crop dusting operations out of the site for years. Willett Flying Service was operational from the early 1950s. He flew Stearmans originally. George Willett pioneered the night dusting operations. The air was much calmer. They would modify the Stearman, employing a 450 hp engine. with a 6,100' paved runway. was a 6/23/55 USDA aerial view (courtesy of Dallam Oliver-Lee). and several runways still had prominent runway numbers visible. A closeup from the 6/23/55 USDA aerial view (courtesy of Dallam Oliver-Lee) showing 3 single-engine aircraft (Vultees) on the Lemoore AAF ramp. Also note the checkerboard pattern apparent on the roof of the 2 hangars on the northwest side of the ramp. Dennis Vasquez recalled, “Lemoore Army Airfield...I lived there at the base in the early 1950s. Some of my earliest memories, at about 3 years old, are of playing on the Vultee trainers that were parked in front of the small building where I lived with my family. I recall one night after a bad winter storm with high winds. My father & others had to recover one of the Vultees that was pushed by the winds across the paved tarmac area. The building that I lived in is one of 2 long narrow buildings located behind the 3 parked Vultees. I think that the 2 buildings were likely fire stations. I recall that there were small living quarters on either side of a central garage-like parking area. The living quarters each had a small kitchen area, bathroom & central sleeping area. Harry Black, a local Lemoore farmer, leased & farmed land located on the perimeter of the base. My father & my uncle both worked for Black. I think that my uncle & his family were likely still living and working there in 1955 when that photo was taken. along with the street grid of the former military installation, including its swimming pool. 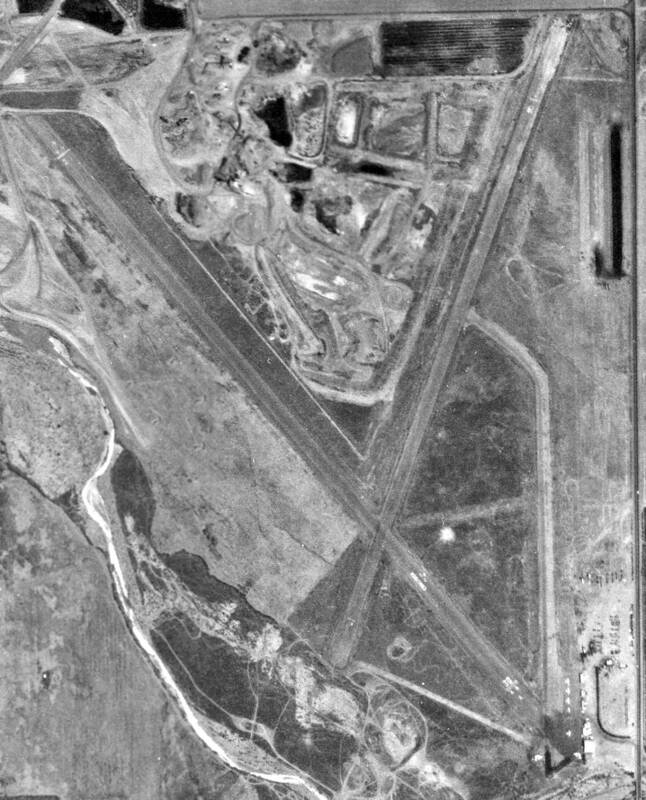 Lemoore was depicted as a civil airfield on the May 1957 Mt. Whitney Sectional Chart (courtesy of Chris Kennedy). with at least 2 paved runways, the longest being a 6,100' northwest/southeast strip. to be used as part of the site for the new Lemoore Naval Air Station. 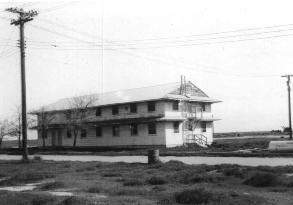 A barracks building at Lemoore AAF in 1958. The building was later relocated to the near the Grangeville gate of Lemoore NAS & used as the ROICC Office. as nothing at all was depicted at the site on the March 1959 Mt. Whitney Sectional Chart (according to Chris Kennedy). 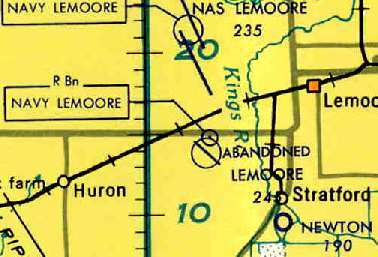 The 1963 World Aeronautical Chart depicted the “Abandoned Lemoore” airfield as having a single northwest/southeast runway. and the much larger runways of the newly-constructed NAS Lemoore were also depicted to the north. were constructed on the same ground previously occupied by Lemoore AAF's satellite field A-6 Summit Lake. depicted a “Willett” private airfield at the site. with the longest being only 3,200' (roughly half the length listed on the 1957 chart). Steve Speerly recalled, “From 1965-67 I was stationed at NAS Lemoore. Being in the crash fire unit we worked 24 hours on with 48 hours off. In our off hours some of us worked Willet Flying Service [at the former Lemoore AAF]. When I left Lemoore the Flying Service was still in operation. with a waiting period before they could be restored. depicted the Lemoore airfield as remaining largely intact. on the June 1966 Mt. Whitney Sectional Chart (according to Chris Kennedy) or subsequent aeronautical charts. showed that much of the Lemoore runways to the east of the ramp were starting to become less distinct. (according to Joe Simpson, as reported in a 1989 Army Corps of Engineers report). which included all of the former airfield facilities. and approximately in 1975 the runway was removed & the area developed for agriculture purposes. showed that the runways to the east of the ramp had been removed & the land returned to cultivation. The eastern 464 acres of the former Lemoore site was acquired in 1980 by the Leonard Oliveira Farming Company. As of a 1989 Army Corps of Engineers report, the former Lemoore AAF site was owned by 2 private individuals. that included the aircraft maintenance buildings, hangars, and parking areas. She used her property as an orchard. which previously contained the taxiways, runways and parking area for the airplanes. That property was also used to raise crops. which were described as appearing to be structurally sound. Two other buildings appeared to be less well-maintained. One of the 2 buildings appeared to be abandoned with windows broken & no doors in the doorways. 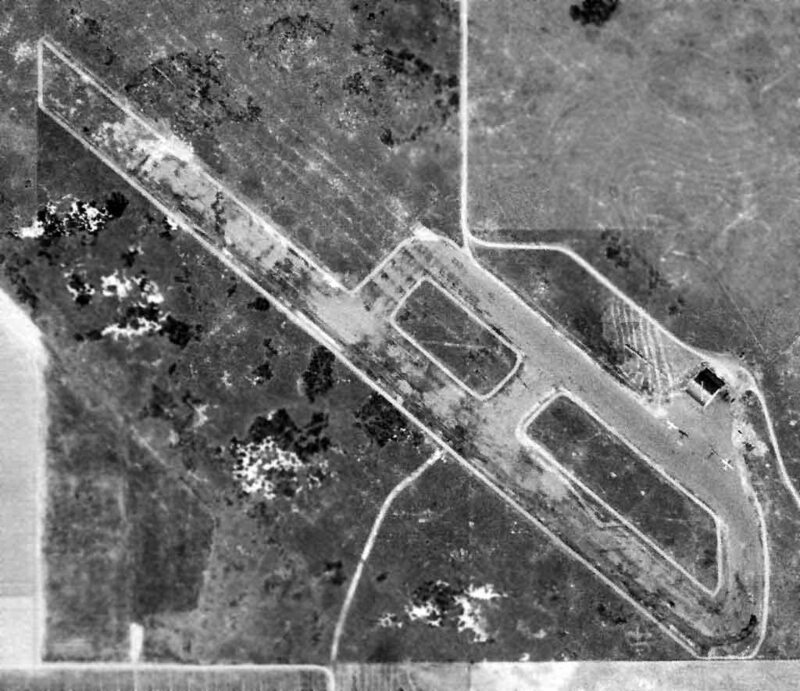 As seen in the 1994 USGS aerial photo, the cleared concrete area in the west half of the photo was once the ramp of the airfield. while another former hangar is at the southwest end of the ramp. 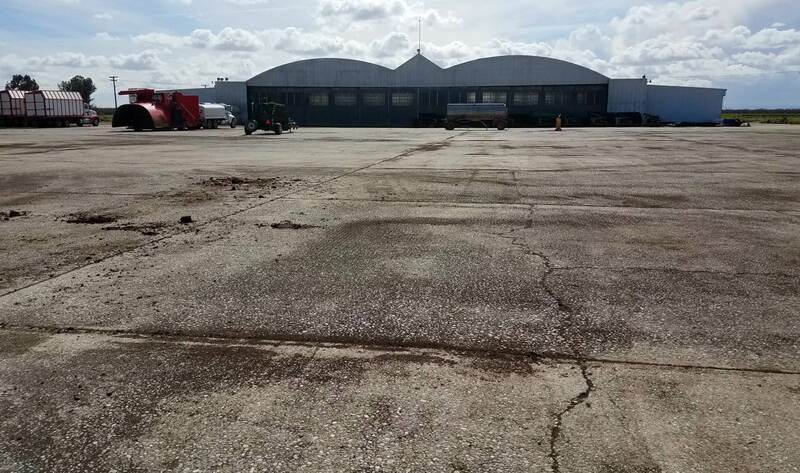 A 3rd hangar (at the northwest) had been removed at some point between 1955-94.
with the land returned to cotton fields. a faint diagonal outline is still barely perceptible in the cotton fields of the former taxiways. Paul Freeman visited the Lemoore AAF site in 1994. 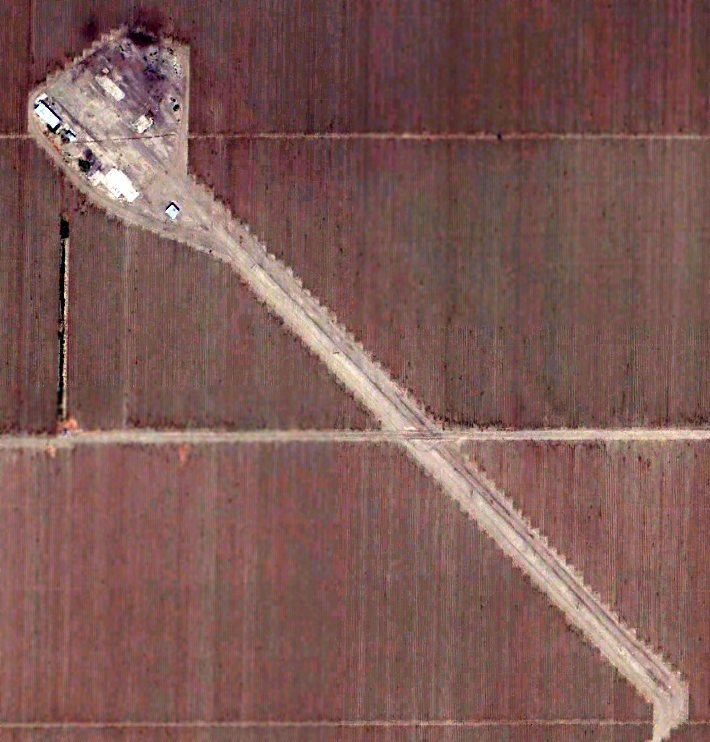 A circa 2000-2005 USGS aerial photo looking southwest at the remaining paved ramp areas of the former Lemoore AAF. 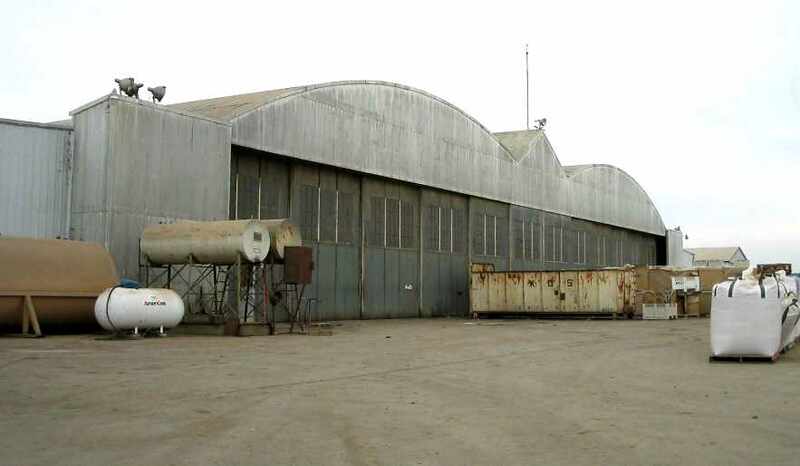 A 2004 photo of the remaining hangar at the northwest end of the Lemoore AAF ramp. A 2004 photo of the ramp & northwest hangar at Lemoore AAF. 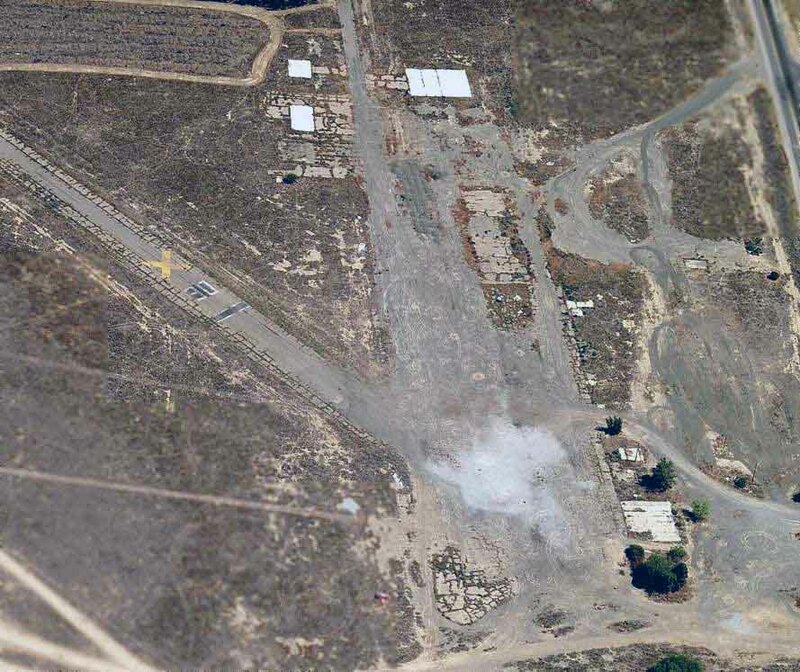 A 2004 photo of the remaining hangar at the southwest end of the Lemoore AAF ramp. No trace appears to remain of any of Lemoore AAF's 6 satellite airfields. Brian Rehwinkel noted, “Lemoore AAF's story is interesting. A 5/5/13 aerial view by Dallam Oliver-Lee looking southeast at the remaining ramp & hangars of the former Lemoore AAF. Note the checkerboard pattern still barely recognizable on the roof of the hangar in the foreground. 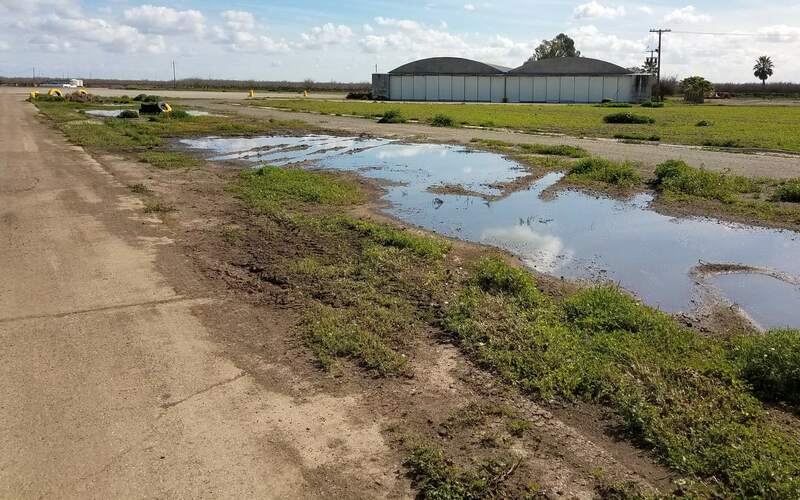 A 3/10/19 photo by Gary Alexander looking southwest at the northern hangar of the former Lemoore AAF. 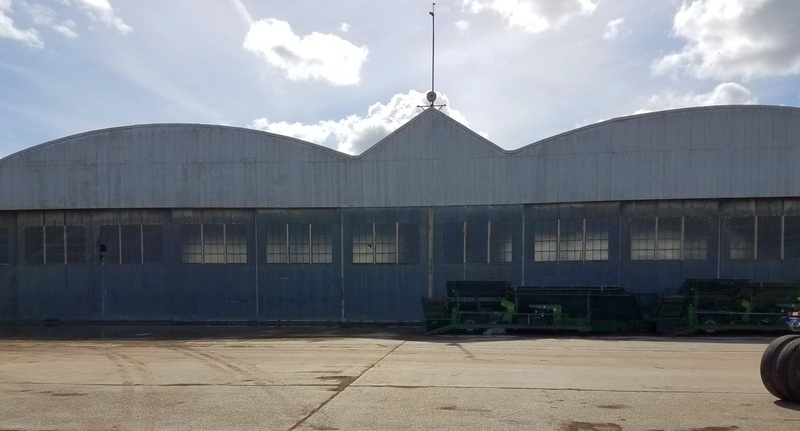 A 3/10/19 photo by Gary Alexander of the southern hangar of the former Lemoore AAF. 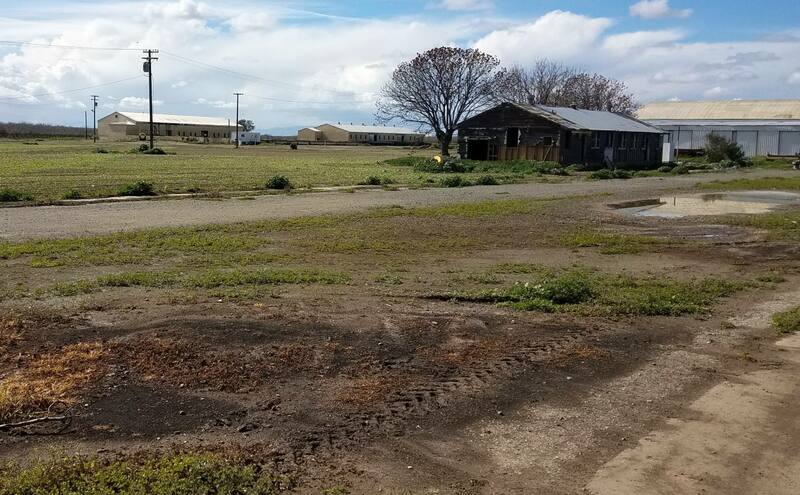 A 3/10/19 photo by Gary Alexander of other buildings at the former Lemoore AAF. 2 miles west of the main gate of Lemoore NAS. Indian Field, as depicted on a circa 1944 Tulare Lake AAF Aeronautical Chart (courtesy of Roger Connor). to support flight training operations at nearby Lemoore Army Airfield. were acquired by the U.S. Government by Declaration of Taking in 1944. Prior to acquisition, the site was native pasture & had not been farmed. The site was developed as an auxiliary landing field by the Army Air Forces in connection with the Lemoore Basic Flying School. with either a "road mix" or oiled surface. 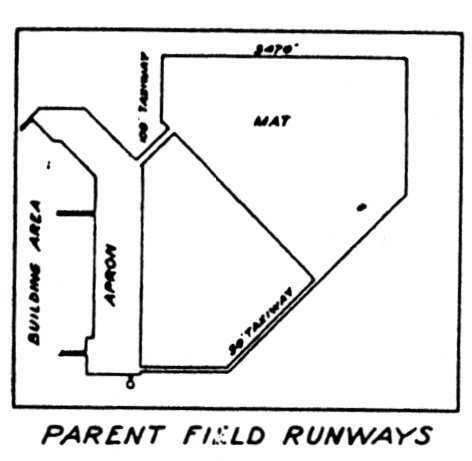 The earliest depiction which has been located of Indian Field was on a circa 1944 Tulare Lake AAF Aeronautical Chart (courtesy of Roger Connor). The March 1946 Mt. Whitney Sectional Chart (courtesy of Chris Kennedy) depicted Indian Field, along with Lemoore AAF & its other satellite airfields. According to an Army Corps of Engineers report, “The WAA assumed accountability of the site on 9/12/46. The 1947 USGS topo map didn't depict anything at the site of Indian Field. Indian Field was no longer depicted on the August 1948 San Francisco Sectional Chart. 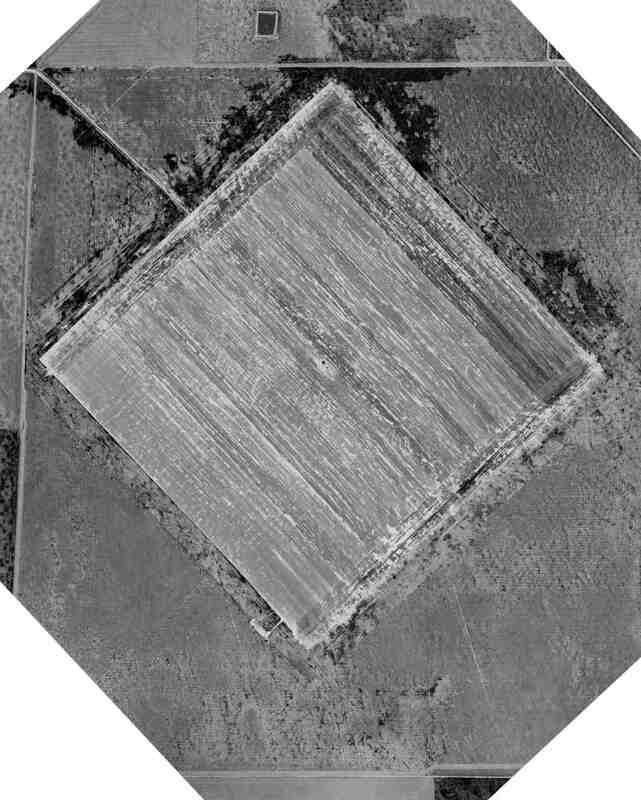 The earliest photo which has been located of Indian Field was a 3/13/50 USDA aerial photo (courtesy of Dallam Oliver-Lee). It depicted Indian Field as having a square landing mat oriented along a diagonal axis. as a labor camp with a large number of small buildings oriented along a northwest/southeast axis (a former runway orientation?). No airfield features were depicted. 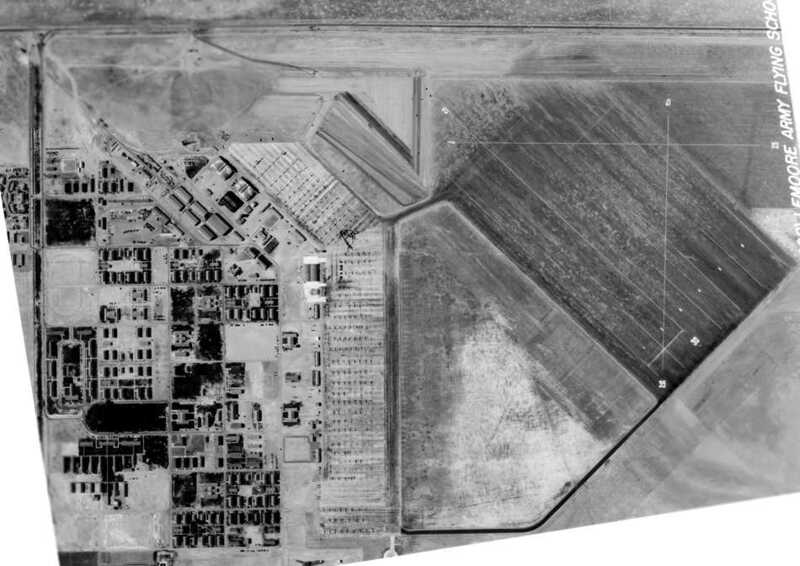 An 8/1/61 USDA aerial photo (courtesy of Dallam Oliver-Lee) still showed remains of the labor camp. The labor camp was still depicted on the 1964 USGS topo map (courtesy of Dallam Oliver-Lee). Dennis Vasquez recalled, “I recall going to what was the old Indian Auxillary Field located off Jayne Avenue near the city of Huron. 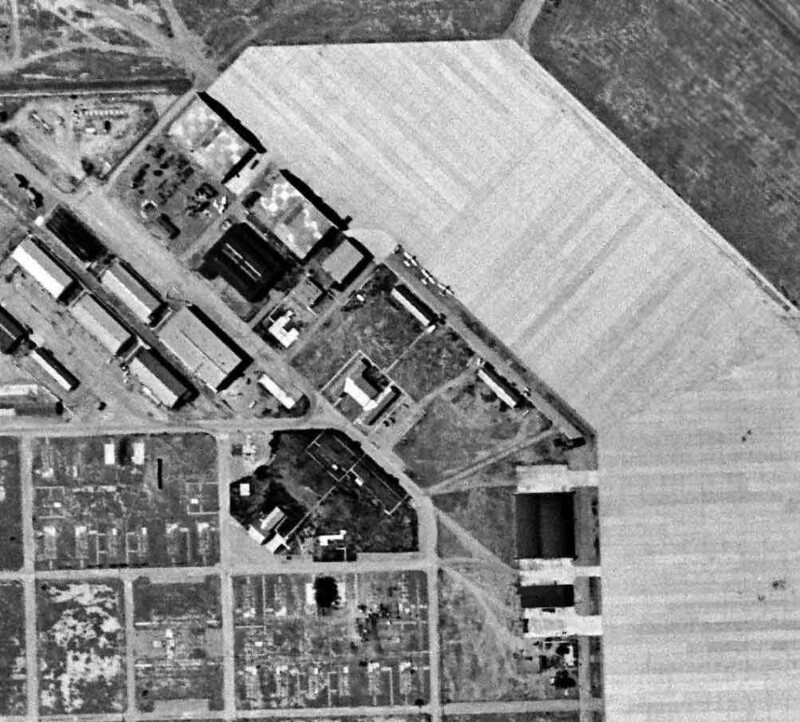 A 1965 USDA aerial photo (courtesy of Dallam Oliver-Lee) showed the remains of the labor camp had been erased by farming. An 8/27/12 aerial view (courtesy of Dallam Oliver-Lee) showed no remaining trace of Indian Field. The site of Indian Field is located south of the intersection of South Siskiyou Avenue & West Jayne Avenue. Thanks to Dallam Oliver-Lee for locating this airfield. 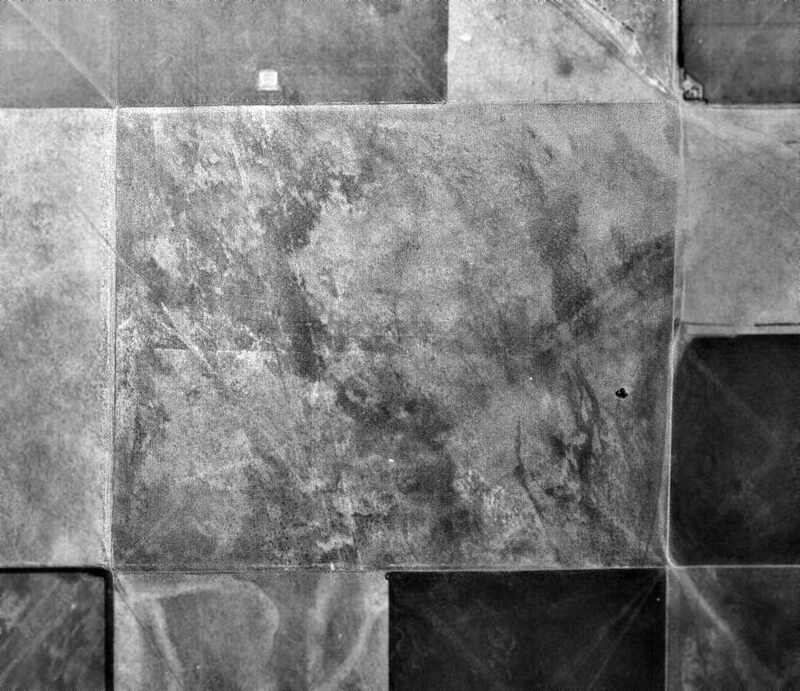 A 12/12/40 USGS aerial view (courtesy of Dallam Oliver-Lee) appeared to show the faint outline of 2 unpaved runways at the site of Lemoore Aux AAF #7.
appeared to show the faint outline of 2 unpaved runways, oriented east/west & northwest/southeast. According to an Army Corps of Engineers report, “The 773 acres that comprised Helm Auxiliary Field #6 was purchased by the U.S. Government on 1/11/43. The site was developed into an auxiliary landing field & basic flying school by the Army Air Corps in connection with the Lemoore Basic Flying School. A WW2-era diagram (courtesy of John Voss) showing Lemoore A-7 along with the parent Lemoore AAF & its other satellite airfields. 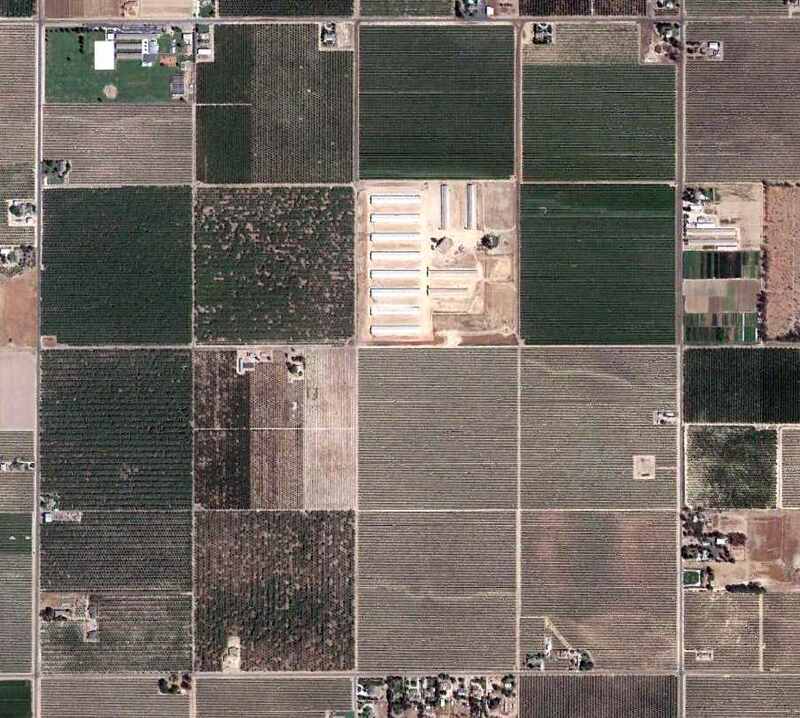 A 4/20/43 aerial view (courtesy of Brian Rehwinkel) showed Lemoore A7 as having a diagonal square landing mat. Brian observed, “As with many other AAF auxiliary fields, this field has a shack in the middle of the field (it just seems that must have been dangerous!). Helm Field, as depicted on a circa 1944 Tulare Lake AAF Aeronautical Chart (courtesy of Roger Connor). The March 1946 Mt. Whitney Sectional Chart (courtesy of Chris Kennedy) depicted Helm Field, along with Lemoore AAF & its other satellite airfields. 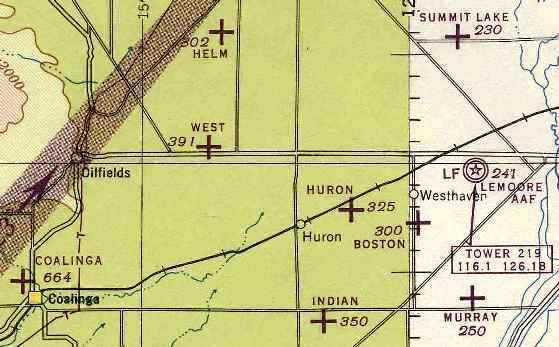 The 1947 USGS topo map didn't depict anything at the site of Helm Field. Helm Field was no longer depicted on the August 1948 San Francisco Sectional Chart. as having a labor camp with a large number of small buildings adjacent to a single northwest/southeast runway. 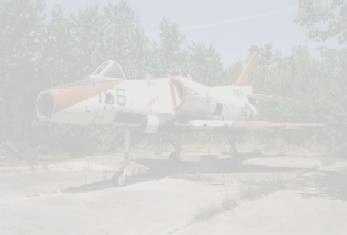 No aircraft or aviation-related buildings were visible on the field. adjacent to a single northwest/southeast runway labeled “Landing Strip”. which was painted with a single closed-runway “X” symbol in the middle. The 1987 USGS topo map (courtesy of Dallam Oliver-Lee) still depicted a single northwest/southeast runway, labeled “Landing Strip”. 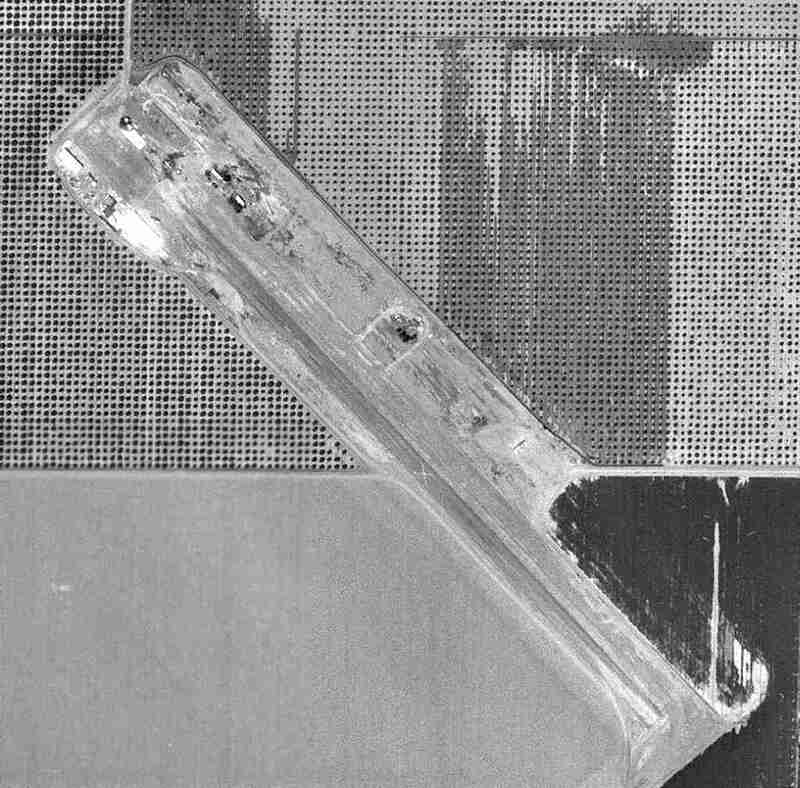 A 5/10/94 USGS aerial photo (courtesy of Dallam Oliver-Lee) no longer showed any aircraft at Helm Field. According to a 1990s Army Corps of Engineers report, “Available information does not indicate when the property was acquired from the WAA. The site is currently owned by several private parties & is primarily used as farmland." A 4/26/15 aerial view by Dallam Oliver-Lee looking east at the remains of the Helm Field runway. The site of Helm Field is located southeast of the intersection of South Yuba Avenue & West Cadillac Avenue. 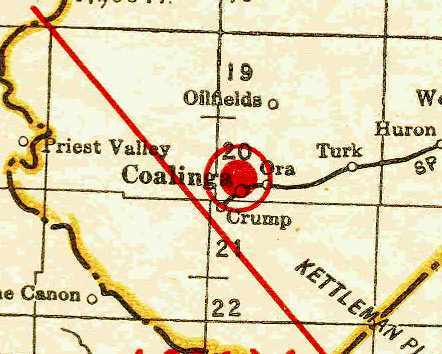 Coalinga Airport, as depicted on the 1929 Rand-McNally Air Trails Map of CA (courtesy of Chris Kennedy). 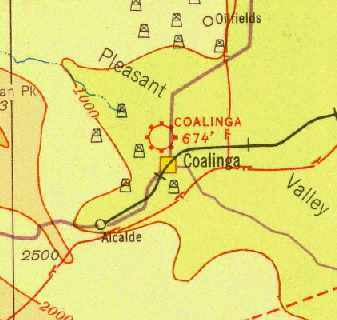 The original airport for the town of Coalinga was located adjacent to the northwest side of the town. The date of construction of the former small general aviation airport is unknown. and the field was said to measure 2,000' x 1,400'. 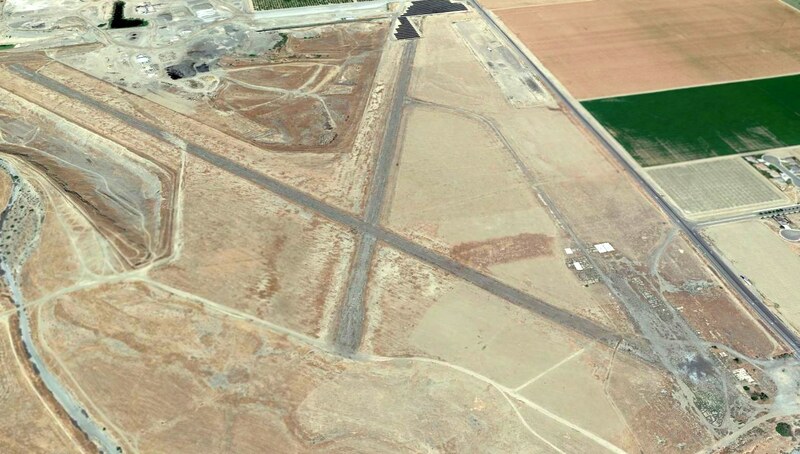 described Coalinga Airport as having an irregularly shaped 2,750' x 2,100' landing area. 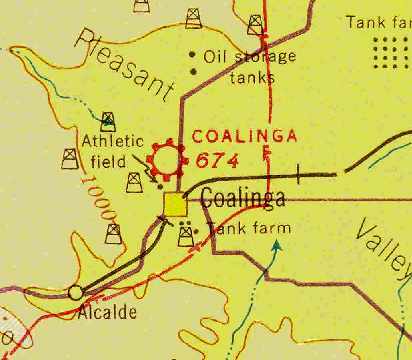 depicted Coalinga as a commercial or municipal airport. with the longest being a 4,200' northwest/southeast strip. It was also described as having a hangar, with "Coalinga" painted on the roof. was an undated aerial view looking south from The Airport Directory Company's 1938 Airports Directory (courtesy of Jonathan Westerling). with the longest being a 3,000' northwest/southeast strip. 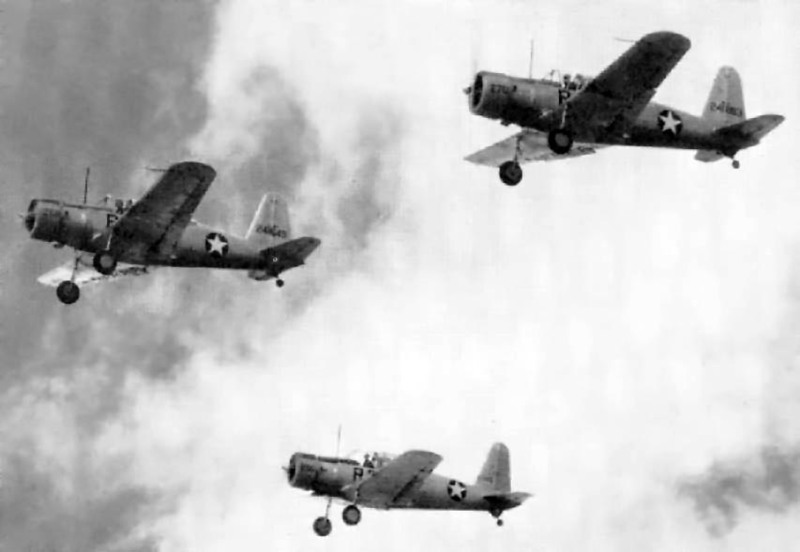 A circa 1930s photo of Army B-10 bombers at Coalinga. Two circa 1930s photo of Army maneuvers at Coalinga Airport. 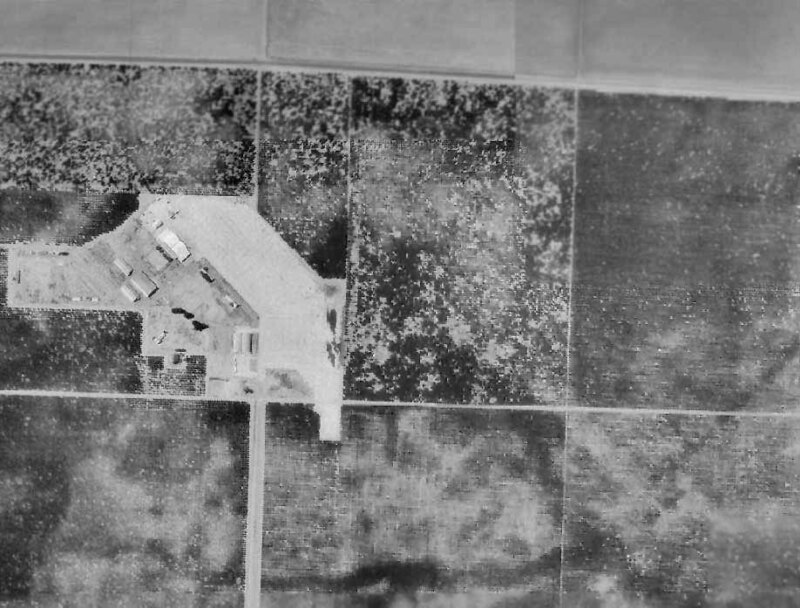 An 11/28/40 USGS aerial photo depicted Coalinga Airport as having 2 unpaved runways, with a small hangar on the southeast side. 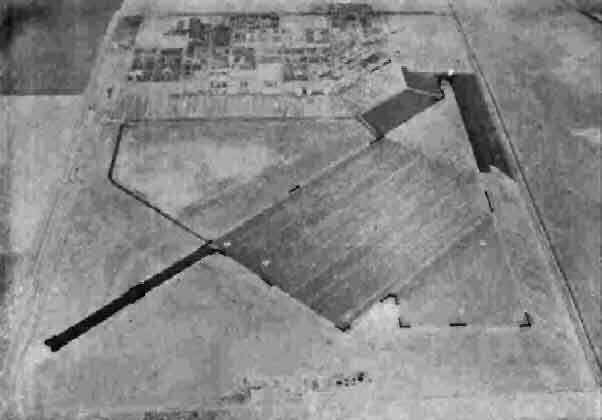 An undated aerial view looking southwest at Coalinga Airport from The Airport Directory Company's 1941 Airports Directory (courtesy of Jonathan Westerling). (according to a 1992 Army Corps of Engineers report). 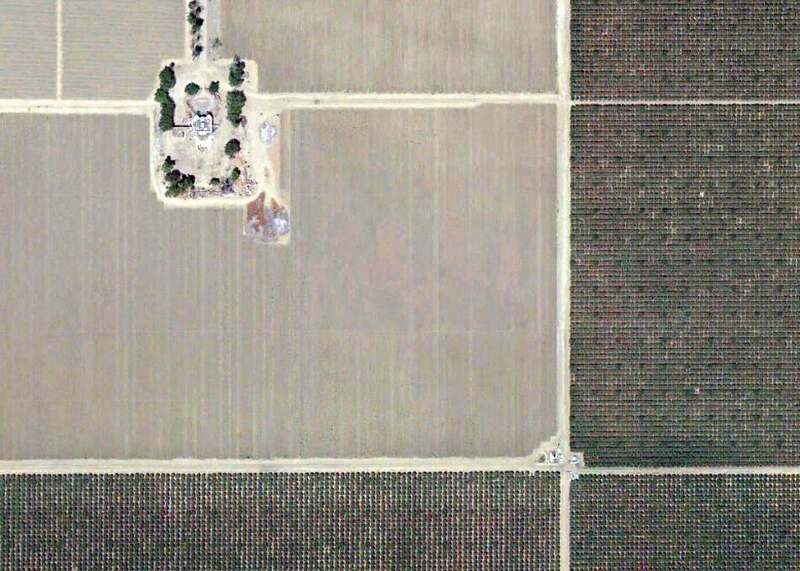 an auxiliary field used to train pilots from the Lemoore Army Airfield, 25 miles to the east. 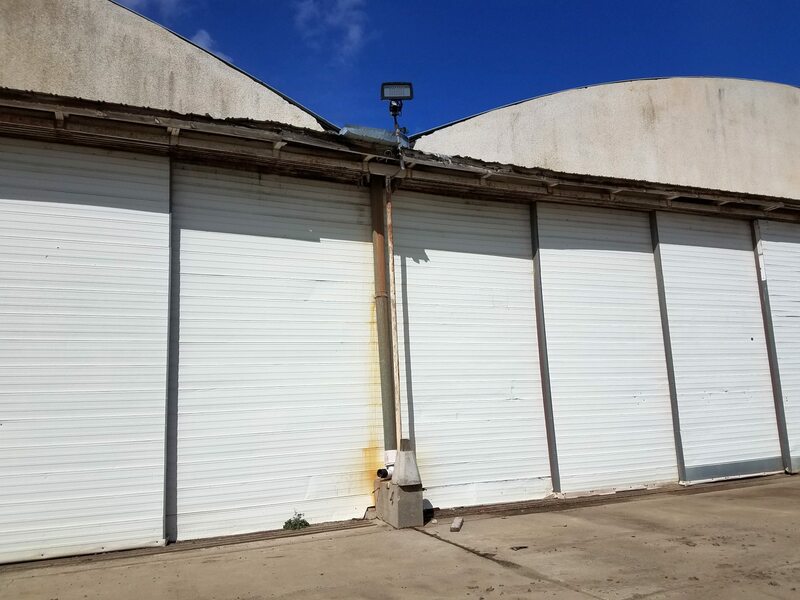 A 3,600 square foot hangar was leased from the Coalinga Chamber of Commerce by the Army Air Force. 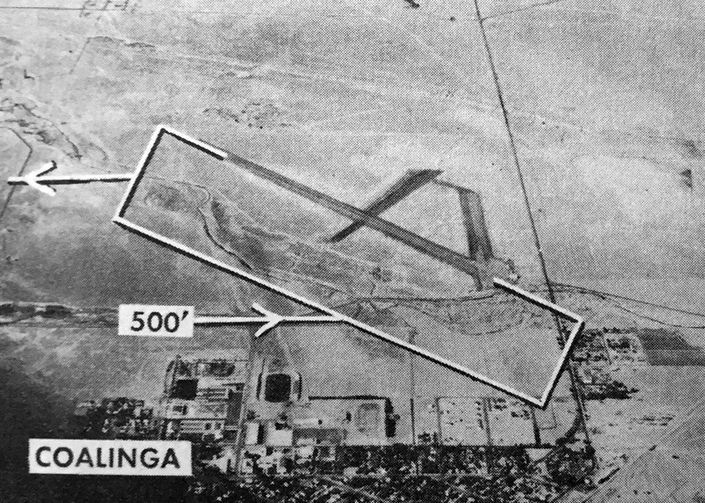 Coalinga Airport was also reportedly used as an auxiliary airfield for Minter AAF during WW2. as having a 3,600' runway. 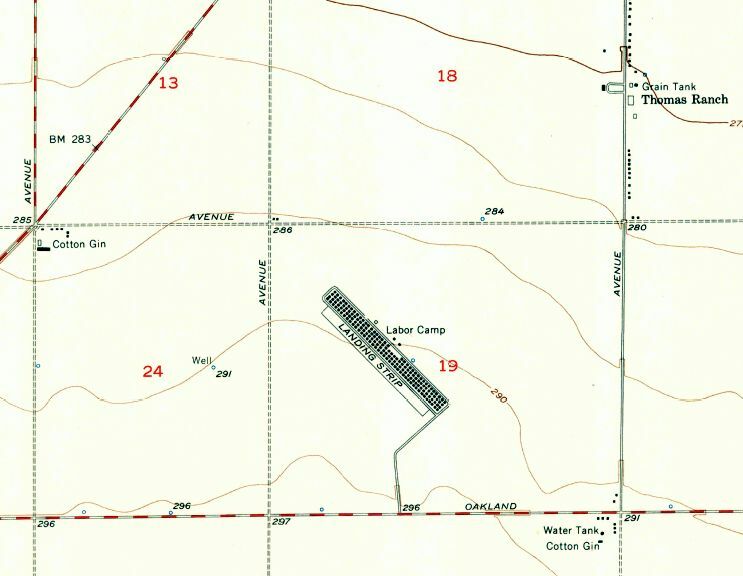 The 1944 USGS topo map depicted an open area north of the town, simply labeled as “Airport”, without any other detail. and both leases were terminated on 5/19/45 (according to a 1992 Army Corps of Engineers report). 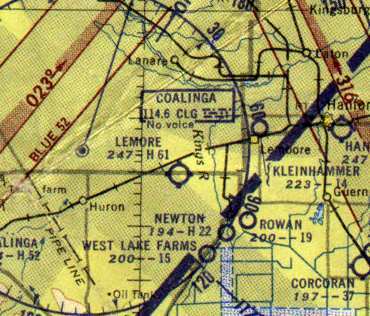 A 1945 aeronautical chart (courtesy of Dan MacPherson) depicted Coalinga as an auxiliary airfield. Ike Stephenson recalled, “Old Coalinga Airport... this airport was once served by Southwest Airlines DC-3s. 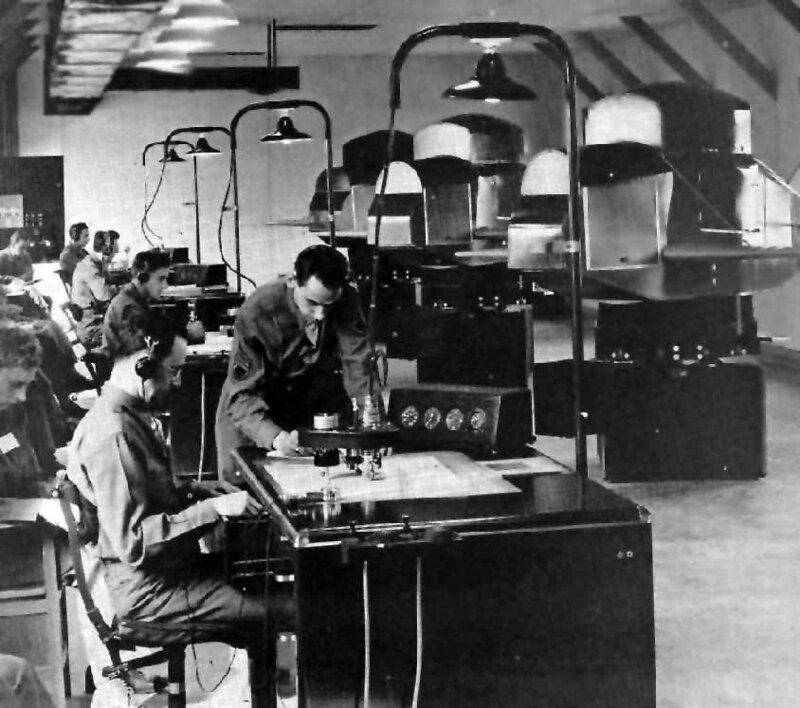 The September 1949 Mt. 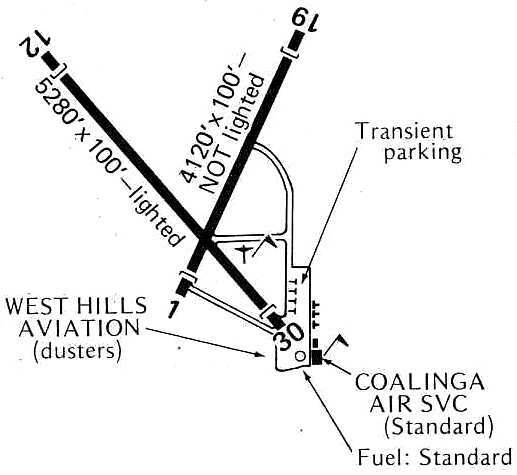 Whitney World Aeronautical Chart depicted Coalinga as having a 5,300' unpaved runway. An undated aerial view looking north at Coalinga Municipal Airport from the 1950 Air Photo Guide (courtesy of Kevin Walsh). It described Coalinga Municipal Airport as having 3 runways, with the longest being the 5,000' blacktop northwest/southeast strip. It listed the manager as N.T. MacCollom. 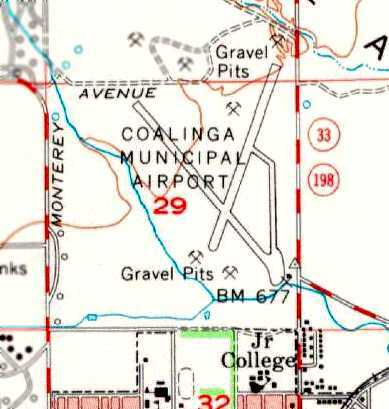 The 1956 USGS topo map depicted the Coalinga Municipal Airport as having 2 paved runways. with 2 paved runways, and the operator listed as "Crumpton Flying Service". An 8/19/70 aerial view (from the UCSB Library) depicted Coalinga Municipal Airport as having 2 paved runways, with 6 light single-engine aircraft on the southeast ramp. depicted Coalinga Municipal as having 2 paved runways: 5,280' Runway 12/30 & 4,120' Runway 1/19. 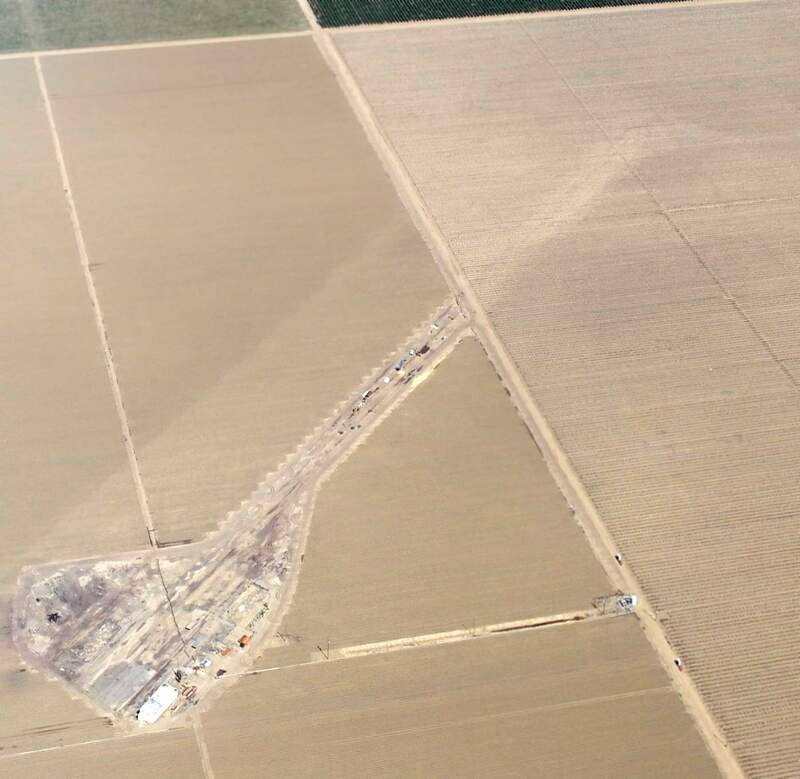 where Coalinga Air Service & West Hills Aviation (a crop dusting service) were located. and the operator was listed as Kiwi Kopters. 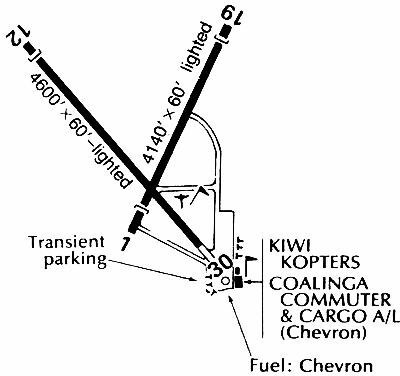 A 1984 airport directory (courtesy of Kevin Walsh) depicted Coalinga Municipal as having a shorter Runway 12/30, having decreased to 4,600'. where Kiwi Kopters & Coalinga Commuter Cargo Airline were located. 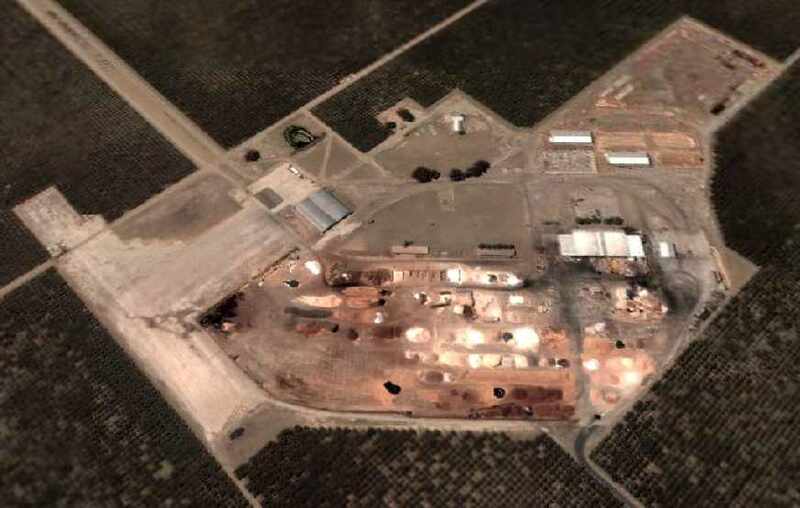 As of a 1992 Army Corps of Engineers report, the Coalinga Airport property was owned by Chevron U.S.A. 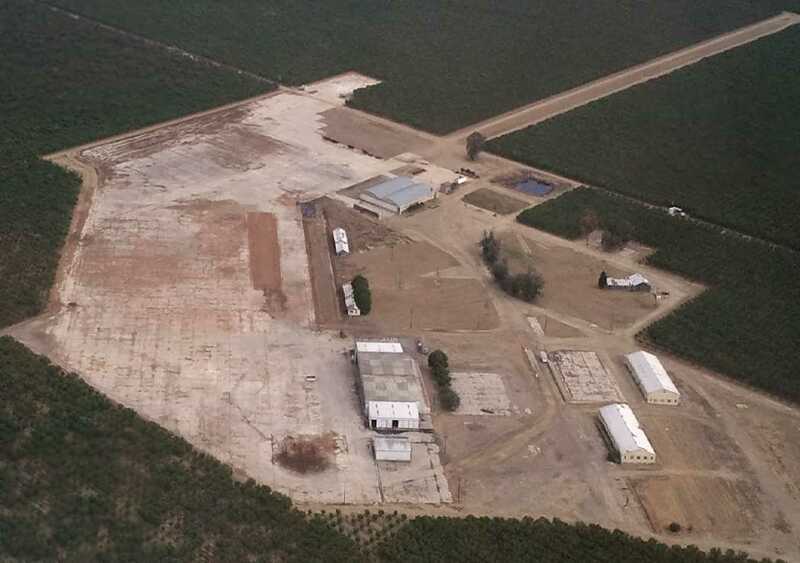 The property was leased by Chevron to the City of Coalinga, and was subleased to Spencer Aviation Company. A site visit showed there to be 11 structures located on the site. All of the structures were either built by the City of Coalinga or private individuals. Three of the 11 structures were built within 1987-92. All of the structures were described as well maintained and in good physical condition. was used by the California Highway Patrol to store aviation fuel for their helicopters. to find it a very lonely place with weeds growing up through badly deteriorating runways. 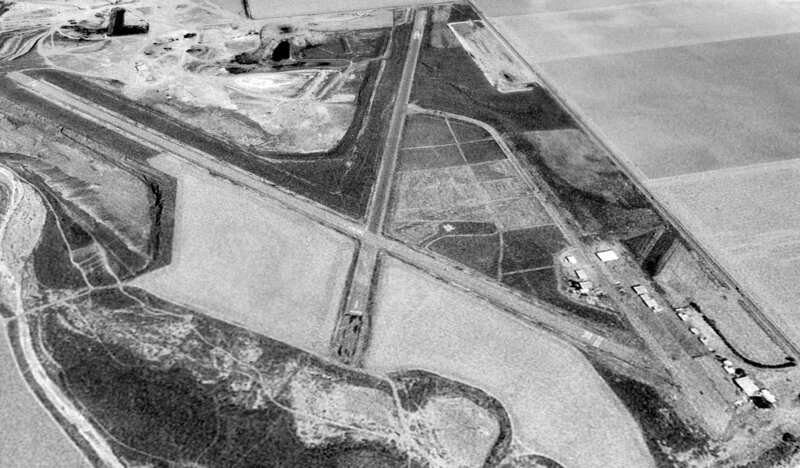 The last photo which has been located showing the original Coalinga Airport still in operation was a 1994 USGS aerial view looking northeast. Two light single-engine aircraft were visible on the southeast ramp. was on the September 1997 San Francisco Sectional Chart (courtesy of Ron Plante). It depicted Coalinga as having 2 paved runways, with the longest being 4,600'. which had been built a few miles to the east at some point between 1994-97. 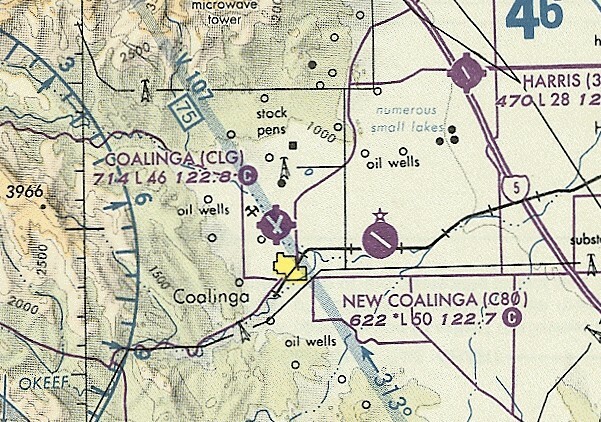 Both Coalinga airports were still depicted as active airports on 1998 aeronautical charts. The original Coalinga Airport was evidently closed at some point between 1998-2002. According to Ike Stephenson, “The reason the old airport was closed is that Chevron Oil owned the land & mineral rights. and the X'd out markings for Runway 30.
showing the foundations of the hangars at the southeast corner of the site. 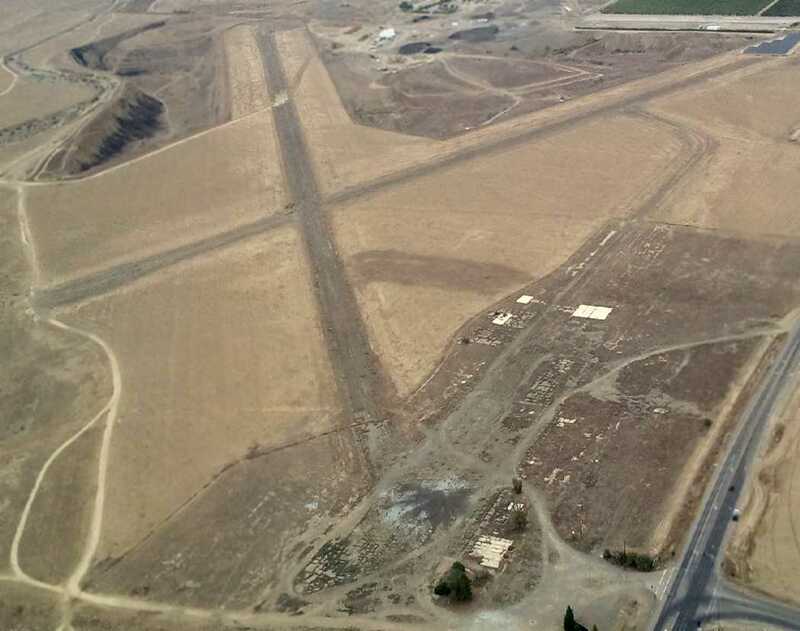 A 2015 aerial view looking northeast at the remains of the original Coalinga Municipal Airport.